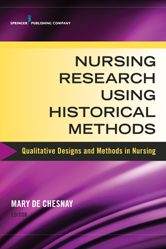 This is a concise, step-by-step guide to conducting qualitative nursing research using various forms of historical analysis. It is part of a unique series of books devoted to seven different qualitative designs and methods in nursing, written for both novice researchers and specialists seeking to develop or expand their competency. Historical research is a qualitative research method that systematically examines past events from existing documents or other data, or by interviewing individuals who lived through those events, in order to understand the past.